A man watches a TV reporting on a possible nuclear test conducted by North Korea at the Seoul Railway station in Seoul, South Korea, Sept. 3, 2017. North Korea's sixth nuclear test explosion Sunday was its biggest underground detonation, with a force estimated to be greater than 100 kilotons — equivalent to 100,000 tons of TNT. The North Korean test drew condemnation from the United States, its partners in Asia and many other countries around the world — even China, Pyongyang's main ally. VOA's Korean service spoke with several experts about why the North continues to fire off missiles and detonate nuclear explosions, despite escalating economic sanctions and increasing ostracism. North Korea's official statements routinely depict the United States and South Korea as aggressors, and Pyongyang’s weapons programs as guarantors of its security. Daniel Sneider, a visiting scholar at Stanford University’s Walter H. Shorenstein Asia-Pacific Research Center, said it is not difficult to understand what the North wants. "They want everybody to believe that they have the capability of delivering a powerful nuclear weapon onto the territory of the United States," Sneider said. "Pretty simple." That also means the North’s weapons programs have become too important for Pyongyang’s leaders to negotiate away in favor of economic concessions or international recognition, many observers believe. However, U.S. and Chinese leaders still agree there should be a "complete, verifiable and irreversible" effort to denuclearize the Korean peninsula. Thus the standoff continues. North Korean leader Kim Jong Un, center, provides guidance on a nuclear weapons program in this undated photo released by North Korea's Korean Central News Agency (KCNA) in Pyongyang, Sept. 3, 2017. What gains from missile tests? Aside from improving the North's military readiness, the tests send a defiant message at a time when U.S. and South Korean troops are staging massive military drills nearby, said Alan Romberg, director of the East Asia program at the Stimson Center: "Choosing this timing also is consistent with Pyongyang's effort to demonstrate that it will not be deterred from acquiring a deliverable, powerful, intercontinental nuclear attack capability and that [U.S.-South Korean] military exercises and tough words will not change that." The tests also may be a risky bid to pressure China to act, said Ken Gause, director of the international affairs group at the Center for Naval Analyses. "This test was aimed primarily at China, to put pressure on [President] Xi Jinping to exert influence on the Trump administration to open unconditional talks with Pyongyang," Gause said. 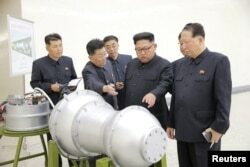 "It is a bit of a risk by Kim Jong Un in that North Korea will face even tougher sanctions. And if China decides to stringently enforce such sanctions [instead of pressuring Washington to ease them], Pyongyang will be worse off in the near term. That said, Kim Jong Un must have concluded that the regime could weather the storm that will befall his country." In this photo provided by South Korea Defense Ministry, U.S. Air Force F-35 stealth fighter jets drop bombs over the Korean Peninsula, South Korea, Aug. 31, 2017. The United States flew some of its most advanced warplanes in bombing drills with ally South Korea. Following the latest test, President Donald Trump criticized the government of South Korean President Moon Jae-in for "talk of appeasement." David Maxwell, associate director of Georgetown University’s Center for Security Studies, said the North is deliberately raising tensions in an attempt to weaken ties among the U.S., South Korea and Japan. "This is about splitting the alliance," Maxwell said. "Of course this test will and has drawn an emotional response, and this continues to play into the North's hands." Washington for years has pursued a mix of diplomatic and military responses to North Korean threats, but as the country develops a capability to directly threaten the U.S. mainland, the stakes have grown. Maxwell advised against direct responses to North Korea’s threats; instead, he recommended continuing to rely on international bodies such as the U.N. to coordinate a response. "We should marginalize the North from an information perspective," he said. "Allow the international community to show its indignation. But we should not reinforce regime legitimacy by showing our 'fear' of the North by our emotional responses." Other analysts says relying on pressure alone has not been shown to be effective, and that the U.S. may not be able to demand denuclearization as a precondition for talking. Gause explained, "That means Washington needs to understand what it will take for Pyongyang to come to the negotiating table — a mix of economic and security guarantees, and put those on the table in return for a cessation of testing. In other words, a freeze is the best the United States at the moment can hope for." In this photo provided by South Korea Defense Ministry, Hyunmoo II ballistic missile is fired during an exercise at an undisclosed location in South Korea, Sept. 4, 2017. Others see potential in more limited U.S. military action, despite the risks. Bruce Bennett, a senior defense researcher at the Rand Corporation, said any attack on North Korea likely would result in a major war, but there are other options. "For example, United States could indicate that it is prepared to shoot down any future North Korean missile tests, if it can do so," Bennett said. "I think the United States could run more extensive military surveillance of North Korea, using reconnaissance aircraft along both coasts of North Korea, flying just outside of North Korean air space." The U.S. also could pursue more extensive economic sanctions, Bennett said, including a more intensive information campaign aimed at persuading North Korea's elites to oppose Kim Jong Un. "There are a wide range of messages that could be sent into North Korea that would complicate Kim’s political situation, just like he has tried with his nuclear tests to complicate the political situation of South Korea and the United States," Bennett said. VOA Koran Service contributed to this story.